Creating a new landscape design for your home is an exciting event for homeowners. It provides the opportunity to bring your vision to life and to enjoy it for many years to come. But with this long term enjoyment there can also be some long term issues if you do not carefully plan for the growth and expansion of your plantings. Considering how your future landscape will impact the use of your property and the property of your neighbors is key to maintaining a beautiful yard and a good relationship with your neighbors. When selecting your plants, consider the mature size of the plants as well as where you are locating them. A small bougainvillea that barely fills a 5 gallon pot today will be well over 8’ tall in less than two years and could easily hang over sidewalks and into a neighbor’s yard. Keep large, fast growing plants away from property lines and areas that could block the view of a driveway or a sidewalk. You might not mind maintaining these large plants but your neighbor probably feels differently. Also, consider the type and amount of debris your plants will produce in the future. Will the trees shed leaves year round? Will there be seed pods falling on the sidewalks? Will they produce hundreds of colorful blooms that will litter the ground each day? All of these traits will increase your yard maintenance as well as that of your neighbors. And if you do elect to install plants that produce a large amount of debris, be contentious in keeping them well-groomed to avoid littering your neighbor’s property. Finally, consider eliminating toxic plants from your landscape if your neighbors have small children or domestic pets. One of the most commonly used toxic plants in the Phoenix area is the Oleander. All parts of the plant are toxic including the dried leaves. Another common plant that is very dangerous is the Sago Palm. The plant is toxic to both humans and domestic pets when ingested. The ASPCA reports a fatality rate of over 50% when a pet eats the Sago Palm needles. The number is thought to be this high because animals seem to enjoy the texture of the plant and will consume large amounts of the plant. Locating toxic plants in fenced areas, where access can be controlled, can be a great way to ensure that no children or animals suffer from the effects of their toxins. Planning for the potential growth and maintenance of your landscape plants is crucial for the long term success of your yard. Your UNIQUE designer can help you to determine optimal plant locations and plant growth rates to be certain that you understand the maintenance your new landscape will require. Being considerate of your neighbor’s property and their ability to enjoy it will help to ensure a many years of enjoyment of your new UNIQUE landscape for both you and your neighbors. There are many UNIQUE projects that homeowners undertake because they believe it will increase their property value. Sadly, many projects end up providing little or no return on investment. But there are certain landscape choices that you can make which will definitely increase the value of your property. Select a quality professional landscape design- A study at the University of Michigan found that a professional landscape design increased the value of landscape projects by as much as 11%. This added value is due to the increased sophistication of a professional landscape design. Plant selections are of a higher quality, plant location is more carefully considered for both the immediate and long term goals and curb appeal was increased due to the cohesiveness of a complete professional design. Use plants to solve issues- No property is perfect but there are always ways to work with any short comings that your property might be facing. If the home is on a busy street with considerable road noise, then a hedge row of trees or large shrubs will act as a screen and help to mute the street noise. Large plants and trees can also provide a visual barrier to screen off views of utility boxes or poles, walls or even neighboring homes. Strategically placed trees can also add shade to a portion of your home help maintain a cooler indoor temperature. Maintenance- After many years of growth, plants can begin to “take over” a space. Trimming and pruning large plants and trees will greatly improve your curb appeal and allow your home to again become the focal point of the property. Architectural features and the style of your home can be hidden behind the years of growth. Proper pruning can reduce the plants back to their proper scale and reveal the features of your home that had become hidden. Enhance features with plants- Having shutters on your home is a valuable feature. A fresh coat of paint and some bright flowering shrubs planted under the shutters will draw attention to these great features. Flower pots adorned with bright paint and blooming flowers will draw attention to a wonderful front porch and add to the curb appeal as well. Lighting-Add value and a sense of security to your home with professional outdoor lighting. Your yard and your home will stand out at night as every passerby can enjoy your landscape and other focal points on your home which had been lost in the darkness. In addition to this new perspective on your home, the lights will add a feeling of safety as you can see throughout the yard for security and safer navigation approaching your home. You might have decided to perk up your property because you are planning to sell in the next year or so, or you could just be completing these projects simply as a way to invest in your property. Regardless of your motivation, by following these simple tips you are making a good financial decision and also increasing the curb appeal of your home for yourself and your community. Even though it is still very early in the year, professionals across the landscape industry have focused in on what is trending and what will be in demand as the year unfolds. 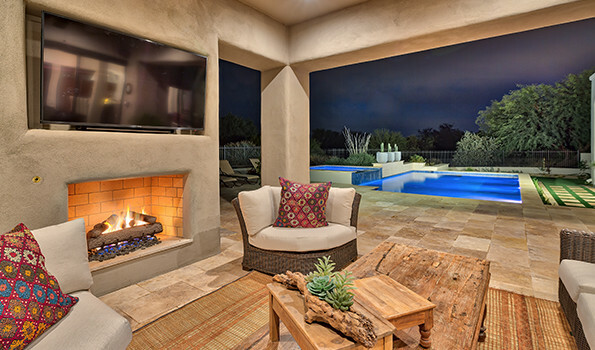 The top four concepts for 2018 all tend to have their roots in a more mindful and healthy view of outdoor living spaces and what they have to offer. Not everyone has a huge yard or the budget for a huge landscape project. But 2018 is going to focus on making the most of any outdoor space that you do have, and on an affordable budget if need be. Turning your expansive suburban yard into an oasis might be a project which needs to evolve over a few years. But once you have your UNIQUE master plan, focus on one small section to begin your transformation. This might be a courtyard, a small patio or outdoor living space or just the portion of the yard which is nearest to your house. Take this area from a plan unusable space and create your own private retreat. Adding plants and other features will make this a space to enjoy even in spite of its limited size. The secret is to add features with dual functions, very much like you might have done when decorating your first tiny apartment. A fire pit set inside a larger masonry structure can provide warmth and ambiance in the winter but is also a great table for impromptu picnics or a glass of wine in the evening. Mounting a small water feature on a wall adds interest but also provides valuable gray noise if the area is sometimes over powered by street noise. The only necessity is that you complete your tiny space and begin your journey to enjoying and embracing the outdoor lifestyle in 2018.